Avenue des Eidguenots et Chemin du Nant-Cayla: Quel avenir pour ce secteur? I sleep so deeply that I rarely remember dreams in the morning. This rule was shattered after my return from India. I had gone there “to lose myself”. That is what I told every one before I had left Geneva on 8 March 2000. My plan was to spend at least three months. In my 63 years whatever was formally planned was never realized. Things just happened and continue to happen! Circumstances or karma or kismet or God (or whatever name humans might like to give) handled every thing differently and brilliantly. I returned from India as fit as when I had left Geneva, exactly after a month. After that I woke up every morning some where in India rushing to catch a train or chatting with people in a country bus or trekking in the tea estates. I continued to remain “lost” in India for another twenty days. Can any one tell me of such a wonderful extended cost free journey without travelling? One morning I woke up having landscaped the ground around a newly built palace into an undulating paradisiacal garden. The palace is real. It’s the “Tamana Palace” inaugurated on 12 March by my old friend “Earl” Davinder of Earls Court, London and his two brothers, one settled in Australia. Hardly a month earlier, Davinder’s formal invitation card was followed a few days later by a stern telephone “commanding” me to book my air travel. That decided my pilgrimage to India. I took off from Zurich on Swissair but on a seat loaned to Air India. The Swiss had turned the seat into a flying carpet; it landed me softy in Delhi in less than seven hours: magic carpet stolen from Air India hooked to the Swiss speed. Next to me was seated a clean-shaven Sikh Jat, Surjit, leader of a team of social workers from Manchester. The team was heading for Jallandhar (Punjab) to build a temple in a nearby village. “Is there a shortage of temples in India” I queried worryingly because I was finding it difficult reducing the number of temples on my “get lost” provisional itinerary. Avoiding my question, he continued, “We want to use it as centre for social work in particular to help widows. We also want to ensure that our children in Manchester remain in contact with their roots. So we bring our families to the village every year. The centre will provide us a base”. When I told him that I was also going to Jallandhar, he invited me to his village. Some are building temples others build palaces! I chose the palace. My cousin, Nirmal, retired Lt. Colonel, now almost fully “civilianized”, received me warmly at Delhi airport and took me home in his Miruti. I stayed with him and not with other more comfortably housed close friends because I wanted to know him and his wife Amrit. They gave me wonderful time. Amrit badly misses her son Gulu, a computer expert who had been recently “brain-drained” to Singapore. Well, these are nearby friendlier and more convenient economic destinations than Germany, USA, Canada, and UK! As expected of an army officer, Nirmal had planned all my trips. This allowed me time to meet and have nostalgic lunch with Harwant and Balbir (ex-Geneva friends) and their lovely daughter Dr. Nilu. On the cool, sunny spring morning of Saturday 11 March, Shatabdli Express took me 300 kilometers north to Jallandhar. My wagon halted right in front of the station main gate. My first visit and what honour! The city offers such welcome only to VIPs. In less than a minute I walked out of the station into the snugly warm late morning. I waited carrying a backpack, wearing jeans and Reeboks trainers and bearing a well-trimmed white beard. I felt a little uncomfortable and odd among people of my own type: the usual “first time” feeling. For good ten minutes Davinder was nowhere to be seen. I scrutinized the dusty traffic of all sorts: rustic looking city people, two- three- and four wheeled vehicles and sternly warding off taxi drivers asserting: “Some one is coming to receive me”. Nobody appeared. I was getting impatient and crest fallen. Some fifty meters to my left I saw some UK-attired Indian. “Davinder” I shouted. It was he accompanied by unique Soma, also ex-Kenyan, and Kirit. What a reunion! We hugged warmly. “Isn’t this the main gate where you’d asked me to wait?” I queried. “We entered through this gate. I told Soma to go to the left and I went to right to ensure that you did not escape,” said Davinder with his usual air of competency. “Well, you did not wait in the middle and forgot that important persons alight from the centre coach”. Carrying four of us his little Miruti took the narrow road in front of the station and squeezed between bullock carts loaded with steel rods, bicycles, three-wheelers, scooters, ten-ton Tata trucks and people. If the train were not destined to be confined to the rail, it would also have passed through this street. This scene is a common feature of the station area in most Punjab cities. We invited ourselves to a cold Coca-Cola in Skylark Hotel where Amarjit, another Kenyan from London joined us. Davinder nosed the Miruti northward on Pathankot road, which links Kashmir with rest of India. The road is so deeply potted that even tanks would be scared to use it! Evidently Indian trucks do better than the tanks because they can manoeuvre around the holes. A left turn drove us through a few villages and across vast lush green wheat fields pregnant with seed. 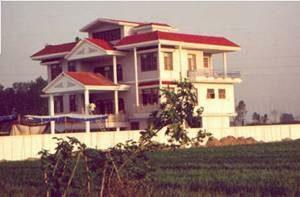 Soon I faced a white red-tiled “Tamana’s Palace in the Fields”, near Rahimpur village, twenty two kilometres from Jallandhar. (see photo). Why build a palace in the middle of fields, was the subject of discussion with Amarjit and Kirit during the evening walk through wheat fields and Rahimpur village, which now looked unimportant in the shadow of just one new building. Even if the three brothers would not return to live in mother/father land from Britain and Australia, it is potentially a good long-term investment. Punjab is changing fast. The first part of the inauguration ceremony early on Sunday morning was prayers, which were recited in a small hall of the palace through one-metre high loudspeaker. Ear-splitting loudness woke up not only those still asleep; but made sure that the words penetrated my dumb ears. I can assure you that they blasted out of the other ear at the speed of sound. An hour later, coming from the ground floor, I heard a familiar melodiously singing of hymns, which soothed the earlier agony. What a pleasant surprise; the singer was no other than G.S. 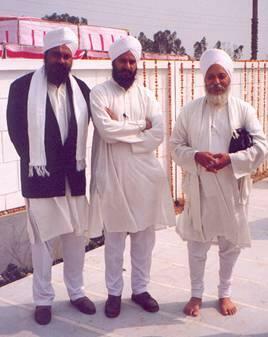 Diwana accompanied by his two sons who for a number of years had delighted Sikh congregations in Kenya. After the ceremony I exchanged greetings and news with Diwanaji. Noting that he was in great demand, spontaneously I stated, “Having met you I have done my pilgrimage. Now I do not need to see the Golden Temple of Amritsar” – one temple less! Another time! The scene moved to an enormous tent, which had been raised in the palace grounds the night before. Young turban-less jean-clad males danced Bhangra robustly in response to equally robust live music and singing. I was told that they were all Sikhs and that their uninhibited dancing is the effect of a good dose of drug. To me they looked normal! “Why aren’t the girls dancing?” I asked Jyoti. “They are the first to take the floor in Britain. It looks so unwholesome”. “Parents in villages associate dancing with prostitutes”, she explained. “Girls dare not dance in public”. “But the songs of the singer beautifully unclothe pretty Punjabi girls”, I reacted. No wonder all girls were sitting with their glum and serious parents. Punjabis do not like to be described as humourless people. They claim that they are world’s most fun loving people. This claim should be accepted with a pinch of salt. The happy ones were a few sitting next to the tent round a bottle of local whisky, one of which I shared. At the flower-decked front palace gate, “Earl” Davinder and his Gujarati “Baroness” Jyoti held court to receive women of the poor sector of rural society including gypsies. These visitors use colourful irritating flattery to wish “happiness in the “kothi” (house), long life, more wealth, many sons, grandsons to the present family clan and to all future clans….”. The rhetoric stops only when the “royal couple” hands them some rupee notes; food alone was not good enough. News of such an event does not require publicity through radio, TV or Internet to attract these professional beggars from the region. It is not common to see an elephant in wheat lands. The previous evening I went out for a walk/jog and I saw one elephant at the back of a farmhouse and men nursing it. I did not realize then that they were camping there for the night and would appear with the full-grown decorated elephant next morning on the newly laid passage to the “palace”. In addition to money and food, it took a lot of heavy weight persuasion to see them off. By the time it became dark most outside activities came to a rather rapid end. Every time electric power got cut, ever-ready generator took over. Soon we settled down in the palatial sitting room, which resembled super deluxe Maharaja lounge. More whisky and beer lowered our inhibitions and led by Amarjit we sang old songs, told jokes and made fun of each other. I had already dropped the idea of going to Amritsar. The next day after a drive through Jallandhar, Davinder stopped at the far end of the famous station road because he dare not drive through it again. He stopped a cycle rickshaw and helped to load my backpack and me. He firmly instructed the cyclist to take me to the rail station. It was through the same tortuous street that had brought me in but with a difference. This time there was no barrier between my lungs and exhaust pipes of trucks belching out smoke hardly a yard away. This was my initiation for the next phase of my journey when I would be on my own. The train ticket to Ludhiana was 25.00 rupees, exactly one Swiss franc. The same journey in Switzerland costs fifty times more. I shared the compartment with four other passengers. Two Punjabi snobs (one was turbaned) who did not return my greetings, or they were so preoccupied in their loud verbose business talk that they did not hear me. These tight shirts disembarked at Phagwara. One of the other two was Sita Ram, a 28-year migrant worker returning home in eastern Uttar Pradesh. 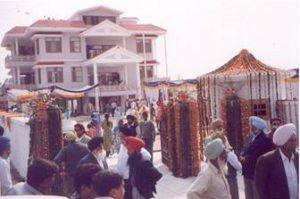 He had worked as assistant nurse in a big hospital in Jallandhar for six years. All these years he had missed his family and had finally decided to set up his “alopathic” practice in his village near Ayodhia. Discussion with him in Hindi for the next half-hour was an invaluable refresher course on India. Finally he said, “I know you are “pura” (full) Indian, but you speak such good Hindi that you must be from overseas. Where do you live?” The train stopped at Ludhiana and I landed more sure of myself than I was at Jallandhar – it was my home territory and no one was coming to receive me. Copyright © 2019 Big Bang Yoga – Science + Spirituality the path to knowledge. | Website developed by CinnamonTeal Design and Publishing.